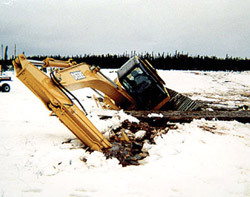 Excavator Mats are used to provide access for tracked vehicles in areas with difficult ground conditions. They are also used to reduce axle weight pressures and reduce the risk of damage where access is required over underground services. These mats are suitable for most types of tracked vehicles. 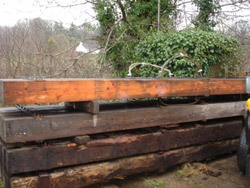 As a guide only, this type of mat may be used to support evenly distributed weights of up to several hundred tonnes dependant on ground conditions. The image above shows just how dangerous and catastrophic crossing some type of lands can be. Diggermats help to over come this problem. 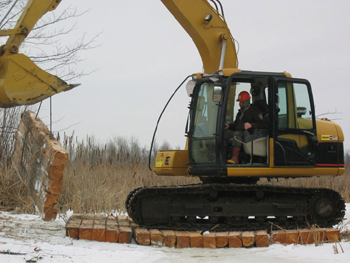 All timber used in the construction of excavator mats is ungraded and therefore no stress calculations can be provided.